The analytical sieve shaker AS 200 is used in research & development, quality control of raw materials, interim and finished products as well as in production monitoring. The controllable electromagnetic drive of the sieve shaker offers an optimal adaption for every product. Sharp fractions are obtained even after very short sieving times. 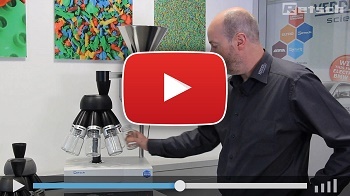 With its all-digital controls, up to 99 sieving programs and calibration certificate the sieve shaker AS 200 control is indispensable for all users who attach importance to precision and operational convenience and need to comply with the guidelines of the ISO 9001.